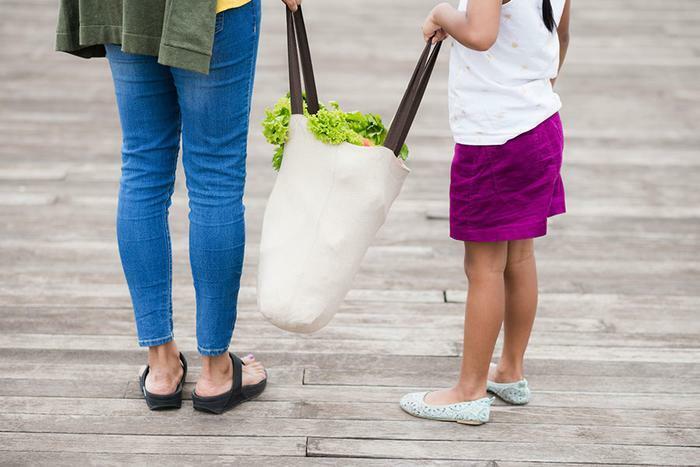 Within the past few years, reusable grocery bags have become a popular option for environmentally-conscious shoppers, but the U.K. Food Standards Agency warns they could house dangerous bacteria unless regularly cleaned. Recent updates to agency guidelines underscore the importance of cleaning reusable grocery bags, citing studies showing reusable bags contain bacteria that can cause foodborne illness. A 2013 study led by University of Arizona and Loma Linda University found almost all of the reusable bags randomly selected from customers entering a grocery store contained a significant amount of bacteria. Nearly half of the bags contained coliform bacteria and 12 percent contained E.Coli. Additional findings from the study revealed the potential health risks of accidentally leaving meat in a reusable bag. When meat juices (such as those that might leak from a butcher package) were added to the bag and left in a car for two hours, the bacteria in the bags grew tenfold. Bacteria can form quickly, which is bad news for those who never wash their reusable bags. If this applies to you, you’re not alone; the same study found that most people seldom, if ever, washed their reusable bags. But washing the bags -- either by hand or machine -- reduced the amount of bacteria present by 99 percent. Another way to reduce your risk of contracting a foodborne illness? Separate your groceries. Separating foods by meats, fresh produce, and household/dry items can drastically cut the risk of cross-contamination (as can never using your grocery bags for other purposes, like carrying your gym clothes). Wash bags once every two weeks. To banish bacteria, wash your reusable bags at least once every two weeks in hot water and detergent. To clean insulated shopping bags, wipe them with a disinfecting wipe after each use (especially if you used it to carry meat). Separate foods. Consider using separate bags for raw fruits and vegetables, raw meat, and other products. This can help reduce the risk of foodborne illness derived from cross-contamination. Use plastic bags (for meat, that is). Put your raw meat products in a disposable plastic bag before placing it in your reusable shopping bag. Don’t store in a hot place. When not in use, store your bags in a cool, dry place like a pantry. Bacteria can spread more quickly in hot places, like the inside of a car.